Tom Clark arrived in the Ojai Valley in 1881, along with his mother and six siblings, after his father, Michael, had sent for the family to join him. Michael had commuted back and forth from Wisconsin to the Ojai Valley since 1868, the year his brother had settled in the Upper Ojai. On his arrival, “red-haired Tommy” convinced the local stage line that he, at 16 years of age, was capable of driving stage for the handsome sum of $30 a month. Before long, he was considered the only driver capable of delivering passengers to Ventura during the valley’s periodic torrential rain storms. 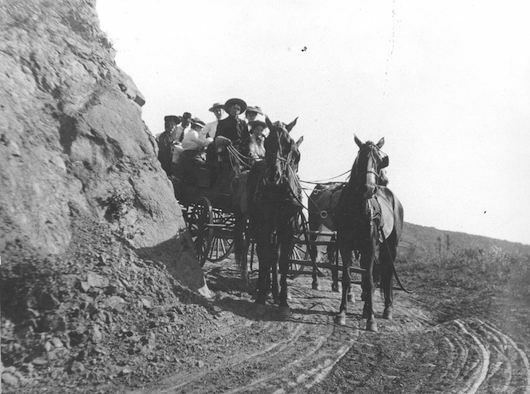 In 1894, he and his brother Will, opened the Clark Brothers Stage Line, charging $1 for trips from Nordhoff to Ventura, and charging 50 cents apiece for luggage. By 1903, Tom, then married and the father of five, was recognized as “one of the most prominent business factors” in the Ojai by the Ventura Democrat newspaper. The following year, he purchased a home, which was the former Oak Cottage rooming house on the S.E. corner of Signal and Matilija Streets. It was a proud moment for Tom when he, the son of Irish famine immigrants, was invited to serve as a founding member of the Committee of Fifteen, “pledged to enforce the law, preserve order and promote good citizenship” in the valley. On November 8, 1904, Tom was elected Supervisor for the 3rd District, County of Ventura, a position he held until 1932. As Supervisor, his main responsibility was facilitating transportation throughout the county-many roads and bridges were built as the result of his determination and political skill. Tom Clark’s youngest brother, Bob, worshipped his elder brother as only an irreverent younger brother can do, emulating his brave deeds and always attempting to outdo them. While both were expert horseman, masters of the “six-in-hand,” Tom was small and compact, reserved, calm, and self-contained, while Bob was tall, rangy, bold, brave, and never met a stranger. Both, however, were distinguished by their red hair and their love for the Ojai Valley. Bob drove stage for Tom during his youth, graduating to serving in the forest Service after his marriage in 1905. He was awarded a Peacemaker revolver by President Teddy Roosevelt for his role in settling the Jenkins-Chormicle Feud during his first assignment as a ranger. 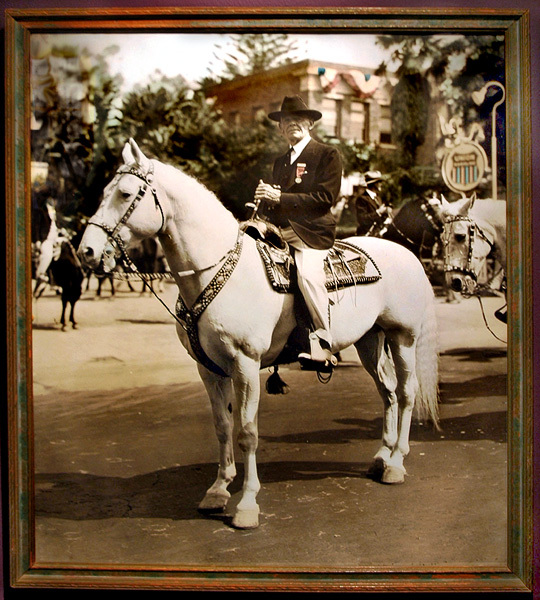 He tried his hand at ranching for a few years, but found his calling when he was elected Sheriff of Ventura County by a landslide in 1922. In 1933, Clark was appointed U.S. Marshal for Southern California, and in that capacity, earned a reputation for his humane treatment of prisoners: “A fellow in trouble appreciates square shooting; I’ve taken hundreds of men to the penitentiary, and I’ve never used handcuffs. They knew I expected them not to double cross me, and not one ever did.” The one time Clark did handcuff a prisoner was at the prisoner’s request. Notorious robber-murderer Juan Marion, whom Clark and others had pursued for 14,000 miles-through Nevada, New Mexico, Arizona, Mexico, and California-asked that he be shackled. “I know that if I’m not handcuffed, I’ll try to escape and I don’t want to double cross you, Bob,” he explained. After retirement in 1949, Bob and wife Alice returned to the Ojai Valley, spending their final years on son Ned Clark’s ranch on Sulphur Mountain where four of their grandchildren live today. Where can we find the account of the Matilija-Wheeler Springs Fire of 1917 written by Henry Sparks? In the Western Honey Bee, July 1917, it was recorded that the fire was started by a beekeeper between Wheeler Springs and Matilija, and that there were five deaths, in addition to the 60 buildings consumed, and half-million dollars damage.